Week 1 was awesome and we are excited to see what Week 2 has brought the Garden State. What a huge Saturday schedule we have with around 18 meets lined up. Keep it here for all this week's results and highlights and remember to send us any photos or videos you have of your top winning performances so they can be featured. If you have a tip for a cool story on a particular performance or if you broke a record of some kind reach out to us as well. Can get in touch with us at rkellert@milesplit.com and or on social media via Twitter, Instagram, or Facebook. I'm still looking for help recording races at meets around the State, would be paid for your time. If you are interested reach out to rkellert@milesplit.com for more information. Meet Directors if you know someone that would help at your meet let me know and we'll see if we can work something out. Quick notes and highlights will be posted below as the weekend progresses, if a full recap comes out for a meet that will be linked as well. Article by Jim Lambert and Robert Kellert. Lily Orr of Rumson-Fair Haven won the 400m running 57.90 which holds on for NJ#4 through the Saturday results. Just four girls under 58 seconds two weeks into the season. Hannah Birdsall of Shore Regional posted a solid early season 800m as well running 2:18.66 for the win NJ#3. Three other girls from this meet made the top ten in the state with Antognoli, Rehder, and Swell NJ#7-9 in the 2:20 to 2:21 range. Len Huang of Holmdel threw 159-05 NJ#10 in the discus. Katherine McGrath of The Lawrenceville School threw 124-10 to place second in this cross-border battle. That ranks her NJ#4 this season. NJ#1! Jason Santa Cruz of Old Tappan hit a 188-02 state leading mark in the javelin to win the Group A title. Bergen Catholic, out of the Group E, ran a very solid 18:15 in the 4x1600m, they lead the state by 25 seconds. They also ran a 10:43.8 DMR. Speaking of the SMR, the girls meet saw four squads under 4:19, they were led by Northern Highlands at 4:16.00. The boys spring medley relay was led by Ridgewood with a 3:33.50, they already lead the state with a 3:32.23 from Arcadia. Liam Landau of Pascack Hills won the award for outstanding field athlete of the meet, had a 14-00 vault (already ranked NJ#1 at 15-00), had a 17-06.5 long jump, and had a role in the Group C winning 4x100m relay and 4x110m shuttle hurdles. State leader alert! Marisa Digia of Old Tappan cleared the 11-06 bar to lead the entire meet and now the entire state. The javelin was led by Alianna Eucker of Bergen County Tech with a NJ#3 mark of 125-0. State leader alert! Isabelle Dely of Paramus Catholic jumped 18-04 to go NJ#1 in the long jump. Her teammate Tiffany Bautista led the meet in the triple jump with her 36-04 NJ#6. Paramus Catholic led both the boys and girls shuttle hurdles, the girls winning Group E with a 1:01.34h and the boys 1:02.40h. The girls 400H event was great, first the 4x400H relay saw a county record by Katherine Muccio, Victoria Purritano, and Virginia Morley of Ridgewood who added up to a 3:13 which took down their own record from last year. Individually Muccio hit a 1:01.44h, which when including hand times would be a state leading time by over a second. Grace O'Shea of Ramapo ran 1:03.44h and Mariah Fede of Paramus Catholic 1:03.74h. Watch the girls seeded 4x800m from Holmdel Twilight, what a battle! The DMR's at this meet were fantastic with six boys teams under 10:40 led by a 10:25 and 10:26 for Kingsway and Camden Catholic, the girls saw West Morris Central, 12:20, Rumson-Fair Haven, 12:25, and Randolph 12:29 all run sub-12:30 as well. Possible kick of the week effort by Sydney Todd for Monmouth Reg in the 4x800m as well which brought them from fourth to first for a winning 9:38.17. Morris Hills boys hit 8:00.00 right on the mark in the 4x800m as well. 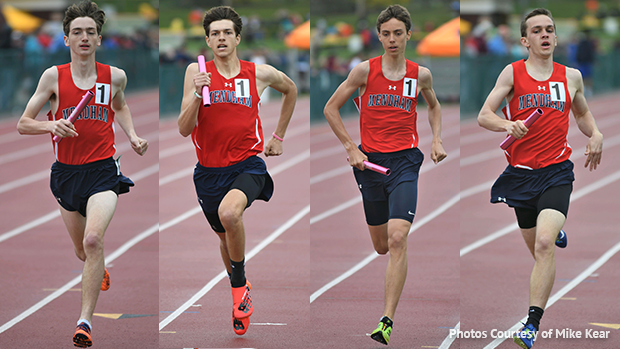 And Rancocas Valley put on a show in the sprints, check the full recap and race videos. VIDEO Watch Nottingham set TWO school records in the 4x100m and 4x200m. The Nottingham boys had a day running NJ#1 in the 4x100m and 4x200m with times of 41.82 and 1:29.12. Louis Akpadago, Shamaili Whittle, Judeson Mirac, and Dana Ridley were on the 4x100m, and Javon Jenkins switched in for Whittle in that order for the 4x200m. Camden boys had a great run in the SMR with a time of 3:34.56 NJ#2. Lucciano Pizarro of Cherokee threw NJ#5 in the shot put hitting a PR of 55-02. Burlington Township won the 4x100 (44.27) and Steven Mendez of Burlington Township captured the 3,200 in 9:59.89. The Pleasantville boys worked their way up to NJ#5 in the SMR with their 3:35.53 victory. Xavior Foster of Winslow cracked the top ten in the state with his 52-04. In a battle between two of top hurdlers in the nation, Sincere Rhea of St. Augustine, the New Balance National Indoor champ over 60m hurdles, finished second in a NJ#1/US#5 13.81. Rhea was edged by Andre Turay of Bullis (Md. ), who ran a US#34 13.80. Last June, Turay was third and Rhea was fourth in the 110m HH at the New Balance Outdoor Nationals. Jarrett Gentles of West Side was second in the boys 300m hurdles in a NJ#1 39.59. Freshman Miranda Lorsbach of Kent Place won the girls 3,200 in a NJ#1 11:31.46, and teammate Kaira Brown placed fourth in the 400 in a NJ#1 55.38. Congrats to the Livingston boys, one point winners over Summit, and to the Mendham girls on their team titles! Paul Brennan of Princeton had a great showing in the throws winning the discus and shot put with marks of 174-10 and 55-02.25. That discus throw is NJ#1 this season and his shot put mark moves to NJ#4. West Windsor Plainsboro North girls hit a NJ#1 in the 800m SMR with a winning time of 1:49.11. Their boys team NJ#6 with a 1:34.96. St. Peter's Prep boys with their fifth in a row and St. Dominic Academy girls take home the 2019 titles. Sophomore Alejandra Bartutis of North Bergen cleared 5-05 in the high jump to move to NJ#2! Xiomari Battle of Ferris hit a mark of 38-04.75 to win and move to NJ#10 this season. Snyder boys bring home the SMR title in a battle with Ferris 3:39.66 to 3:41.29. Snyder NJ#12. John O'Connor of Hopewell Valley took home the mile run with a 4:25.89, that is third in the state including 1600m conversions. The Hunterdon Central boys and Hillsborough girls won the large school titles, and Somerville boys and Warren Hills girls captured the small school titles at Hunterdon Central. Bridgewater-Raritan's Marco Langon, the New Balance Indoor National freshman champion in the mile, ran a NJ#1 4:21.11. Steeplechase time! Delia Russo of Colts Neck won the 2000m Steeplechase with a 7:31.66, the boys race went to Jackson McCarthy of Princeton at 6:20.70. The Rancocas Valley boys took over the state lead and were the first to break 8:00 in Spring 2019 for NJ with their 7:59.66! Will work on splits. Solid hurdle performances: Naseem Smith of Deptford moved up to NJ#2 with his 14.31 victory in the 110H. In the 400H Terris Burton of Steinert crossed the line with a 54.96 for NJ#2, he's just the second NJ boys under 55 seconds this season. State leader alert in the javelin thanks to Danielle Mills of Morris Catholic who threw a massive PR of 128-06! Kate McAndrew and Laura Green had a solid race in the mile with a 5:09.62 and 5:11.18 NJ#3 & NJ#4. James Lynch, who's already cleared 14-01 for NJ#2, got over the 14-00 bar in the pole vault once again for the win. Matawan, the host team, swept the Division 1 team titles, Christian Brothers Academy and the Westfield girls grabbed the Div. 1 championships. The Rumson girls blasted a pair of NJ#1 times in the SMR (4:10.43) and 4x100 (48.62). Bryanna Wilson of Howell had a great throwing double as the freshman unloaded a NJ#2 41-6 to win the shot put, and won the discus with a NJ#2 and PR of 127-7.